Started by Doug Miller in 1989, the In the Tradition series brought senior traditional musicians to Libertyville, Illinois for concert performances that were recorded on video tape. 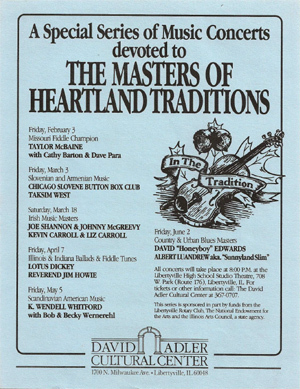 I was contracted to research and write interpretive program essays for a dozen performers-Masters of Heartland Traditions-presented in 6 concerts in the small theatre at Libertyville High School. A teacher at the High School trained several Adler House volunteers to work the three television cameras. Bill Christopher, a folk music enthusiast and professional videographer was in the control booth. I interviewed the artists on camera before the show, and then emceed the evening concerts. The raw video footage was edited by Bill, Doug & Jennifer Jeffries (another volunteer) into 11 programs broadcast on community access cable television. In 1991, another 9 performers-Masters of Regional and Ethnic Traditions-were brought in for 6 more In the Tradition events. Three of these concerts followed of the original format and were held at the High School. The other three were concerts and dances at the American Legion Hall in downtown Libertyville. These were not recorded on video (though several unofficial audio recordings do exist). Again, I was contracted to write program essays, interview the artists and emcee the concerts. Several In the Tradition concerts using these formats were videotaped in 1992 after Doug Miller's departure to be director of Folklore Village in Dodgeville, Wisconsin. By 1993, when I started as Director of Folk & Ethnic Music Programs, the high school theatre was no longer available. Subsequent In the Tradition concerts were held at Adler House, including a World Music Fest set in the Terrace Gardens. The series also spun off an annual Old-Time Fiddlers Reunion. All were documented on audio recordings.